I really do love the Bible. I have centered my education, practiced my occupation, and lived my life, as closely as I could by the timeless and immutable truths found there. I have not always been right, but the Bible has. I have not always been trustworthy, but the Bible has. Oh, how I love Your law! It is my meditation all the day. You, through Your commandments, make me wiser than my enemies; For they are ever with me. I have more understanding than all my teachers, For Your testimonies are my meditation. I understand more than the ancients, Because I keep Your precepts. I have restrained my feet from every evil way, That I may keep Your word. I have not departed from Your judgments, For You Yourself have taught me. How sweet are Your words to my taste, Sweeter than honey to my mouth! Through Your precepts I get understanding; Therefore I hate every false way. I have sworn and confirmed That I will keep Your righteous judgments. These verses express my heart. I would love to say they express my entire being, but there I have failed – often. My actions and thoughts and habits have not always been perfectly in line with the heart of the psalmist as he penned this psalm. It is interesting that this singer is not identified. There are several good possibilities for his identity which range from Moses to David, or Daniel or Hezekiah or Ezra or Malachi. Whoever it was, it is clear he had a deep love for God and His Word. He wanted to live for God. He knew God’s word was key to his goal. I like to think he had a heart no too unlike my own. 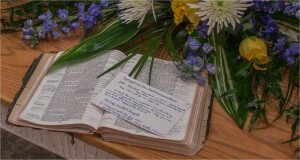 The Bible pictured above is the last of my father’s preaching Bibles along with a sermon note card written with his hand to use as he presented from the book which he too loved. Blessed are You, O Lord! Teach me Your statutes. 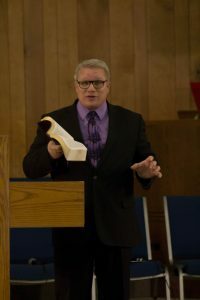 One might think that the Apostle to the Gentiles, having read or sung this psalm may have had these thoughts in mind as he reminded Timothy to “Be diligent [study] to present yourself approved to God, a worker who does not need to be ashamed, rightly dividing the word of truth” (2 Timothy 2:15 NKJV). So I spend much time and energy in God’s Word, the Bible. I will never feel as if this is somehow wrong or divisive or futile, even though the more I learn, the less I feel I know. There is depth and breadth which cannot be determined this side of eternity, but I intend to keep digging until I get there. I hope you will as well.